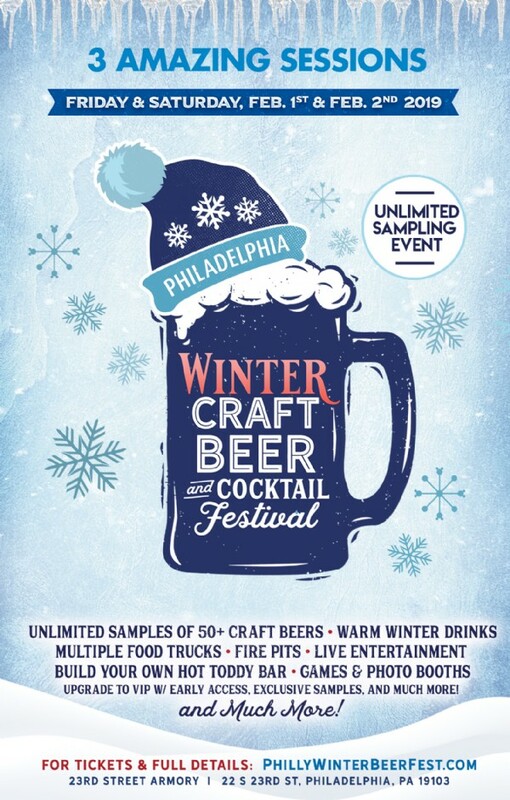 Includes unlimited samples of 50+ amazing local & national craft beers & warm winter cocktails, a commemorative tasting glass, great entertainment, food trucks, photo opps, vendors, games, decorations, giveaways, and much more! General Admission Friday Session hours are 7:00pm - 11:00pm. Includes everything with General Admission tickets, just at a great discounted group rate. Must purchase 6 or more tickets together to qualify. VERY LAST TICKETS AVAILABLE FOR THIS EVENT!! Includes everything listed with General Admission tickets PLUS 30 minutes early access for first crack at all beers & warm festive cocktails, event t-shirt, larger sampling glass, added VIP stations, and more! THIS TICKET IS FOR PEOPLE WHO PREVIOUSLY PURCHASED A VIP ADMISSION VOUCHER ON *GROUP ON* FOR THE FRIDAY SESSION ONLY - A SPECIAL GROUPON REDEMPTION CODE IS REQUIRED. Includes unlimited samples of 50+ amazing local & national craft beers & warm winter cocktails, a commemorative tasting glass, great entertainment, food trucks, photo opp, vendors, games, decorations, giveaways, and much more! General Admission Saturday Session 1 hours are 12:30pm - 4:30pm. THIS TICKET IS FOR PEOPLE WHO PREVIOUSLY PURCHASED A GENERAL ADMISSION VOUCHER ON *GROUP ON* FOR SATURDAY, SESSION 1 ONLY - A SPECIAL GROUPON REDEMPTION CODE IS REQUIRED. Includes everything listed with General Admission tickets PLUS 30 minutes early access (12:00pm) for first crack at all beers & warm festive cocktails, event t-shirt, larger sampling glass, added VIP stations, and more! THIS TICKET IS FOR PEOPLE WHO PREVIOUSLY PURCHASED A VIP ADMISSION VOUCHER ON *GROUP ON* FOR SATURDAY, SESSION 1 ONLY - A SPECIAL GROUPON REDEMPTION CODE IS REQUIRED. VIP Group Discount for groups of 6 or more for Saturday Session 1 (12:00-4:30pm). Includes unlimited samples of 50+ amazing local & national craft beers & warm winter cocktails, a commemorative tasting glass, great entertainment, food trucks, photo opps, vendors, games, decorations, giveaways, and much more! General Admission Saturday Session 2 hours are 7:00pm - 11:00pm. THIS TICKET IS FOR PEOPLE WHO PREVIOUSLY PURCHASED A GENERAL ADMISSION VOUCHER ON *GROUP ON* FOR SATURDAY, SESSION 2 ONLY - A SPECIAL GROUPON REDEMPTION CODE IS REQUIRED. Includes everything listed with General Admission tickets PLUS 30 minutes early access for first crack at all beers & warm festive cocktails, event t-shirt, larger sampling glass, added VIP stations, and more! THIS TICKET IS FOR PEOPLE WHO PREVIOUSLY PURCHASED A VIP ADMISSION VOUCHER ON *GROUP ON* FOR SATURDAY, SESSION 2 ONLY - A SPECIAL GROUPON REDEMPTION CODE IS REQUIRED. Ticket includes access into the festival. Ticket does NOT include any samples or a sampling glass. Ticket is good for 1 session only - you can attend any session you would like.